Chronic kidney disease (CKD) is primarily diagnosed with blood and urine tests that detect chemical imbalances caused by the progressive loss of kidney function. The tests may be accompanied by imaging tests and biopsies used to pinpoint the exact cause of the dysfunction. Kidney function tests, also known as renal function tests, are important for monitoring the progression of the disease and your response to therapy. They are also vital to staging the disease and can help differentiate CKD from an acute kidney injury (AKI). Chronic kidney disease develops when the kidneys, for whatever reason, are unable to filter waste and regulate the balance of water and acids in the body. The disease can be diagnosed by measuring certain substances, known as markers, that either rise or fall when the kidneys are impaired. The screening process begins with a battery of blood and urine tests that evaluate standard diagnostic markers such as serum creatinine (SCr), glomerular filtration rate (GFR), urinary albumin, and blood urea nitrogen (BUN). Serum creatinine (SCr) tests measure the amount of a substance called creatinine in your blood. Creatinine is a by-product of muscle metabolism that is excreted in urine. Because creatinine is produced and excreted at a fairly steady rate, it is a reliable measure of kidney function. Glomerular filtration rate (GFR) is an estimation of how well your kidneys are functioning. Specifically, it estimates how much blood passes through the tiny filters of your kidneys, called glomeruli, each minute. To calculate your GFR, the lab will use an algorithm that factors in your SCr value, age, ethnicity, gender, height, and weight. The result can provide your doctor a relatively accurate picture as to whether your kidneys are functioning normally or abnormally. GFR values can vary slightly from one lab to the next, as some may use a different formula to calculate the GFR. To this end, it helps to have your tests performed at the same lab to ensure consistency. It is also important to note that older people tend to have values lower than 60 because the GFR intrinsically decreases with age. Another means of estimating GFR is a test called creatinine clearance (CrCl), which compares your serum creatinine with the amount of creatinine excreted in urine over 24 hours. The algorithm would also factor in your age, ethnicity, height, and weight. Glomeruli are components of a filtration unit called a nephron. The role of nephrons is to filter out larger cells like red blood cells and proteins so that they are not excreted. When the nephrons are damaged, protein and blood can escape and exit the body in urine. One such protein, called albumin, can be used by the lab to detect proteinuria, the excessive accumulation of protein characteristic of kidney disease. To diagnose proteinuria, the doctor may either perform a 24-hour urine test or, alternatively, calculate the ratio of urinary albumin to serum creatinine. Blood urea nitrogen (BUN) measures the amount of a waste product in your blood, called urea nitrogen. Urea nitrogen is created when the liver breaks down protein and, like serum creatinine, is produced and excreted at a fairly consistent rate. High BUN value can also suggest the underlying cause of a kidney failure, including heart failure, dehydration, or urinary tract obstruction. Urine volume is the amount of fluid you urinate over a given period of time. It is primarily used to diagnose AKI and is measured in milliliters (mL) per kilograms of your body weight (kg) per hour. Oliguria, the production of abnormally small volumes of urine, is characteristic of an acute kidney injury and is defined as anything less than 0.5 mL/kg/h. Oliguria is less common with CKD. Ultrasound is the preferred method of imaging. It can be used to measure the size and appearance of the kidney and help locate tumors, lesions, and blockages. A newer technique called a Color Doppler can be used to identify clots, strictures (narrowing), or ruptures in the blood vessels of the kidneys. X-rays are mainly used to assess the size of kidney stones or to measure the size and shape of the kidney. Computed tomography (CT) is a type of X-ray that can produce cross-sectional images of the kidneys. CT scans can be useful in detecting cancer, lesions, abscesses, obstructions, kidney stones, and the accumulation of fluid around the kidneys. They can be used for obese people for whom an ultrasound may not provide a clear picture. Magnetic resonance imaging (MRI) uses magnetic waves to produce high-contrast images without radiation. 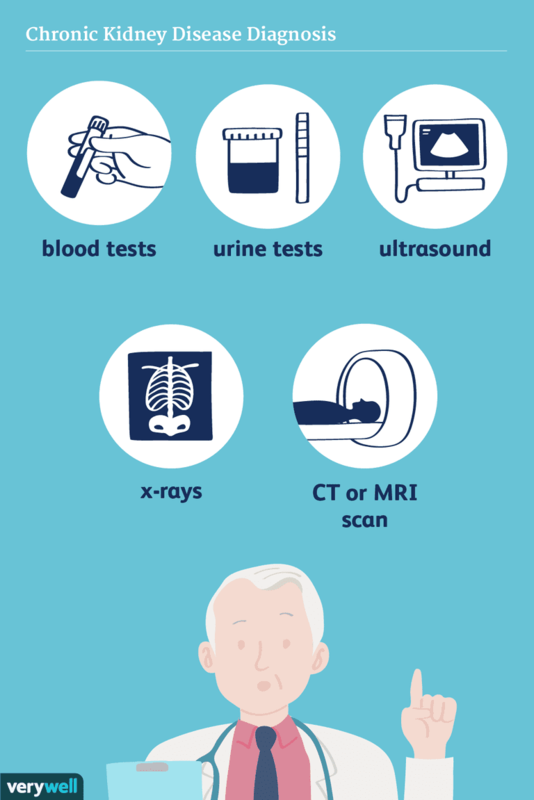 While it can be just as useful as a CT scan, an MRI often requires a gadolinium contrast dye, which can cause a potentially fatal skin disease called nephrogenic systemic fibrosis (NSF) in people with poor kidney function. A kidney biopsy involves taking a tissue sample of your kidney to examine under the microscope. The biopsy may either be percutaneous (in which a needle is inserted into the kidney through your abdomen) or open (where tissue is obtained through a one- to two-inch laparoscopic surgical incision). Serious complications of a kidney biopsy are uncommon. In rare cases, bleeding can cause the formation of a renal clot and the inability to urinate. Infection is also possible but less likely if wound care is adhered to. The purpose of kidney disease staging is two-fold: to establish how functional the kidney is, and to determine the most appropriate course of treatment. For CKD, the staging is based solely on GFR results, which correspond to appropriate treatment plans. When there is evidence of renal impairment, the doctor's first task is to differentiate between chronic kidney disease and acute kidney injury. This is because AKI is often reversible if treated promptly and appropriately. By contrast, CKD is a progressive disease requiring lifelong monitoring and care. There are a number of diagnostic clues that can help distinguish between the two conditions. Ozmen, S.; Akin, D.; and Ozmen, C. A Review to Differentiate Acute Kidney Injury from Chronic Kidney Disease. BJMMR. 2016;18(9):1-7. Selby, N.; Fluck, R.; Kolhe, N. et al. International Criteria for Acute Kidney Injury: Advantages and Remaining Challenges. PLoS Med. 2016;13(9): e1002122. DOI: 10.1371/journal.pmed.1002122.